Oh schnap. Ubisoft is so busted on this one. This is the ad. 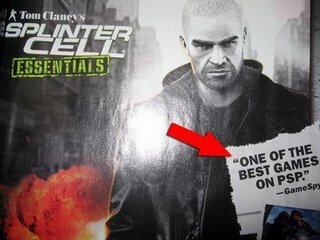 Notice the quote, "One of the Best Games on PSP.". Looks fine right? Pretty much you're standard boiler plate "this is the best game ever!" ad right? Well, apparently not. The quote is attributed to GameSpy but GameSpy's review trashed the game. Ubisoft apprently took the positive quote from the GameSpy's preview of the game in which the previewer (the same person who gave the game a bad review actually) got to play a demo of a certain level and described the game at that point as "one of the best games (we've played) on the PSP" . You can't really fault Ubisoft for wanting to use any kind of positive quote they could so they could move some product but still, it's pretty shady. A Gamespy editor responed to 1up's story on this little edbacle of sorts and basically stated that the preview made cast the game in a promising light but the final product was actual poo.